Ernie Trammell always had his heart set on being a lawyer, a profession that runs deep in the family. After graduating from law school, Ernie returned home to Anderson to practice in a partnership that focused on civil litigations involving personal injury, medical malpractice, and products liability. In 1996, with 14 years of experience practicing law, Ernie set off to form his own firm with the goal of focusing his practice in the area or Workers’ Compensation. 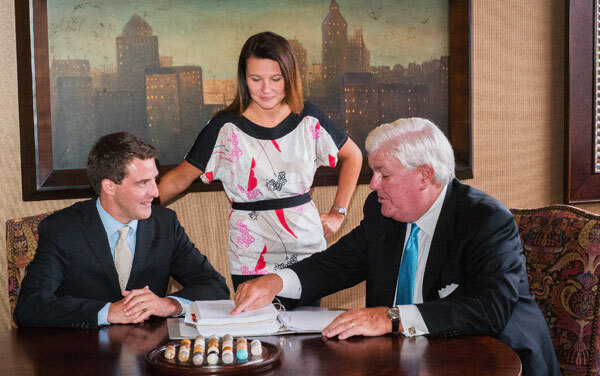 Twelve years later, Trammell & Mills Law Firm, LLC, now employs three other attorneys, Trey Mills, Brad Bledsoe, Roy Trammell, and an experienced staff ready to make sure your legal rights are protected. workers who have suffered on the job injuries. victims of car and truck wrecks, and especially interstate trucking accidents. persons injured in accidents occurring on someone elses property such as slip and falls and dog bites. persons injured as a result of defective products, vehicles or machinery. Suffering a personal injury through no fault of your own can be a nightmare for you and your family. Our commitment is to maximize the physical, emotional, and financial recovery of each victim that we represent. With over 50 years of combined experience, our highly skilled lawyers are keenly familiar with the difficulties and frustrations faced by personal injury victims. We care about our clients and realize that we must know and understand their losses and needs in order to right their wrongs. Trammell & Mills Law Firm, LLC and specifically Ernie Trammell, has been awarded the prestigious AV peer review rating from Martindale-Hubbell. This rating is determined based on the attorney’s evaluation by his or her peers, who are in the best position to assess the attorney’s ethical standards and professional competence. The AV rating is a significant rating accomplishment, as it is a testament to the fact that a lawyer’s peers rank him or her at the highest level of professional excellence. The A indicates that the attorney’s professional ability in the area where the lawyer practices, his expertise, and other professional qualifications are considered by his peers to be very high to preeminent. The V indicates that the attorney’s adherence to professional standards of conduct and ethics, reliability, diligence and other criteria relevant to the discharge of professional responsibilities is considered by his peers to be very high. The legal system can be an overwhelming and intimidating process to go through and choosing a lawyer to best represent you is no easy task. It’s only natural to want to find the best lawyer possible to represent you, and a good lawyer can mean different things to different people. Some might say that you only need to be well educated and experienced, yet aggressive in the courtroom. Others might say that it’s more important to be intuitive and think outside the box. It takes all of these qualities to make a good lawyer, but what separates a good lawyer from a great one is genuine compassion and care for every client. At Trammell & Mills Law Firm, LLC, we’re confident that we have great lawyers dedicated to successfully resolving your legal issues. Suffering a personal injury through no fault of your own can be a nightmare for you and your family. At Trammell & Mills Law Firm, our commitment is to maximize the physical, emotional, and financial recover of each victim we represent. Copyright © 2019 Trammell and Mills Law Firm, LLC. All rights reserved.